What does it take to overcome disease and loss? Acclaimed author Yuyuko Takemiya (Toradora!, Golden Time) explores this in her latest romantic comedy about the story of an insecure manga club captain and the ace of the swim club. Insecure because of scars from open-heart surgery as a child, all Manga Club captain Hotaka Yoshimatsu can do is look longingly from afar at his crush Niki Awaya, the ace of the swimming club. Niki seems to be in a world out of his reach but after being forced to take his first swim test in years, Hotaka has a seemingly chance encounter with Niki that marks the beginning of a friendship between the two of them. Fans of romantic comedies aimed at the shonen demographic will find plenty to like here, as well as fans of Takemiya’s other works. 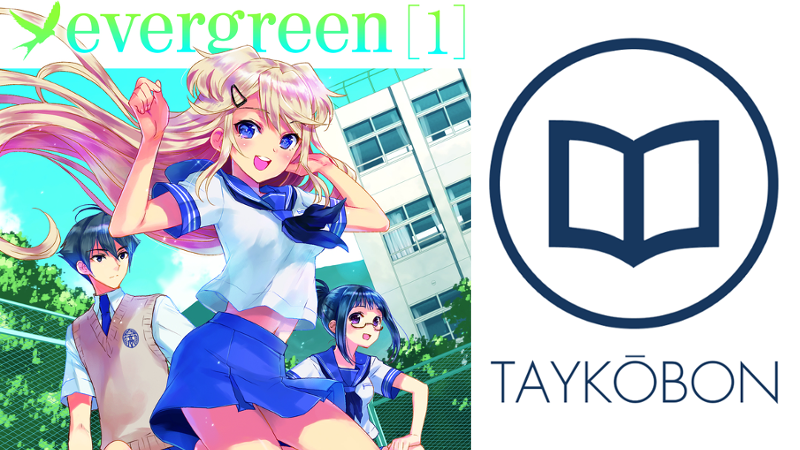 I found the premise and execution of Evergreen’s story to be an enjoyable and fun read because of the way it successfully balances comedy, romance and psychological drama in the early going. Hotaka is an engaging protagonist and it was interesting to slowly learn more about what makes him tick throughout this volume. While some may find him grating due to his overwhelming insecurity, I felt Takemiya did a good job making him relatable enough as a protagonist and that this never became a problem. Niki also shows signs of being an interesting character and I appreciated the way Takemiya interspersed dream sequences to help hint at some of her thoughts even though for most of the volume we only get to see her from Hotaka’s perspective. The rest of the supporting cast are enjoyable, each adding their own bit of humour and giving the story a lot more life than it would have if they had not been so well characterized. Although Evergreen Vol. 1 doesn’t do anything particularly innovative in telling its story, it executes quite well upon its premise and left me wanting to know what happens next. The artwork in Evergreen was another highlight of this volume, with artist Akira Kasukabe’s artwork infusing a distinct sense of life into the series. Character designs are all memorable and Kasukabe’s artwork conveys the emotions of each character wonderfully. In addition, the panels are cleanly drawn and easy to look at, with the extremely detailed scenes showcasing Niki being artistic standouts. While the story was well presented in this volume, there were some very subtle signs that left me worried about the long-term direction of the plot. I won’t get into it for the sake leaving readers here unspoilt, but there is a tease present that would really undermine the strength of this story and I really hope that what is being teased isn’t actually the case. The translation provided by Seven Seas is good for the most part, but there is a particularly bad instance during final chapter that seems like either a mistranslation or a bit of really bizarre dialogue on Takemiya’s. This instance really stuck out because it happens during an otherwise dramatic chapter-ending scene and really left me wondering what was going on. The dialogue did not make sense with what was otherwise occurring during the scene and might have benefited from further explanation. Evergreen Vol. 1 is an entertaining romantic comedy that provides a very solid start to the series. The characters are entertaining and interesting, with Kasukabe’s artwork bringing them to life in a wonderful way. There are admittedly some worrying signs about where the story is headed as well as a really odd bit of dialogue which damages the impact of a key scene, but I genuinely enjoyed this volume a lot for its strengths. While it doesn’t do anything that hasn’t been seen before, it’s still an example of a romantic comedy series done right and should be of interest to fans of the genre. Evergreen Vol. 1 was published by Seven Seas Entertainment on May 12th, 2015. Authored by Yuyuko Takemiya and drawn by Akira Kasukabe, the series ran from 2011-2015 in ASCII Media Works’ Dengeki Daioh Genesis and Comic Dengeki Daioh magazines. Volume 2 will be published in English on August 11, 2015.